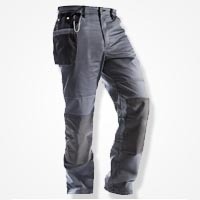 Looking for a NEW style of work trousers...? Janser provide a vast range of advanced kneepads and workwear (or work trousers with kneepads) to protect your legs and knees, with additional padding support. Other workwear accessories include goggles, ear defenders, high grip gloves and much more, to protect your hand, ears and eyes too. Please browse through our workwear collection via the link above. Our new ACTIVE-LINE work trouser is available NOW! They compliment our “Classic” work trouser range, introducing an “Active-Line” to our quality collection. The great modern cut trouser has all the pockets a floor layer could possibly need! If these are of interest to you, please do not hesitate to submit an enquiry today.